It’s that time of year again. School holidays are coming to an end and it is time to start getting things ready for the new school year. For some, this might be the first time you are having to pack a lunchbox, and for others, it might be a time of looking for new ideas to keep the kids happy. Either way, there are a few important things to consider when packing a lunchbox for your child as they are spending majority of their day there and that little box (or sometimes suitcase!) should provide at least one third of their nutritional requirements for the day. A little bit of planning will make sure that your child has good attention levels all day and help them make the most out of learning time, socialising time and playing time. 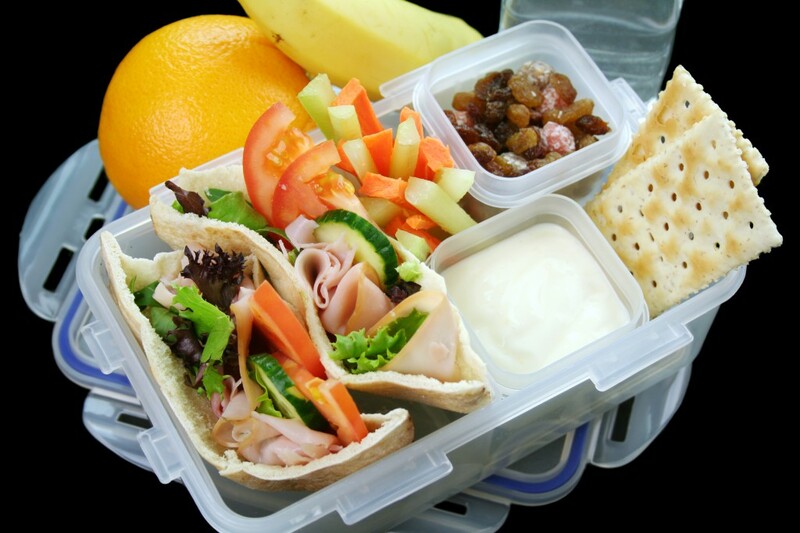 It is important to ensure that the lunchbox is filled with a variety of foods from all of the food groups to help your child get through the day without feeling hungry or tired. Breads are the most common form of cereals found in school lunch boxes. There is such a wide variety of breads available in supermarkets and bakeries, so it is a good idea to vary the type of bread you use. Using wholegrain pitas, wraps, rolls and various types of bread will not only provide a good source of carbohydrate, but also fibre and other essential nutrients. The cereal component of the lunchbox does not have to be in the form of a sandwich though, many children are preferring to take rice or pasta salads (or warmed in a thermos). Trying to use a wholegrain option like brown rice, and varying the type of pasta you might include (both varying the shape, as well as the grain source – wheat, corn, rice, quinoa pasta etc). Always ensure that children have protein at each main meal of the day. It is easy to add this protein into their sandwiches or salads in the form of cheese, egg, fish, chicken, meat, legumes (e.g. chickpeas, lentils, hummus dip) or a nuts/nut spreads (if school policy allows). 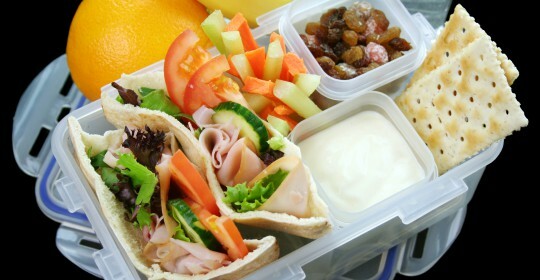 Other good sources of protein for the lunch box are yoghurts, custards or cheese (cheese sticks, cheese cubes). Be sure to pack at least one piece of fruit into your child’s lunch box. Fruit contains many essential nutrients as well as fibre which ensures the health and satiety of your child while they are at school. Different fruits contain different vitamins and minerals, so trying to vary the colour of the fruit you provide throughout the week will ensure that your child is receiving a good range of nutrients. Try to include some vegetables– whether you put some salad into their sandwiches or salads, or some baby tomatoes, carrots, capsicum strips or celery sticks in the lunchbox to serve as a snack. Just like fruit, different coloured vegetables contain different nutrients so vary the colours of the vegetables you include. It can sometimes be hard to get your children to eat enough vegetables so let them help decide which vegetables will go into their lunch box to increase their interest in eating them. A small pot of dip, like hummus, may improve their attitude to their intake of the vegetables you provide. Water is the best drink and should be encouraged for school aged children. Try to avoid providing sweet drinks like fruit juices and soft drinks as they provide lots of calories without much nutrition. Another option for drinks is unflavoured milk which comes in small ‘prima’ boxes. As these milks are UHT, they will travel well to school. This can be a nourishing snack and a much better alternative to soft drinks or juices. A treat should be just that… a treat. Try to have one day of the week, fortnight OR month when you put a special treat into the lunchbox rather than putting ‘sometimes’ foods in every day. Many preschool and primary schools strongly discourage the inclusion of treats in the lunchbox (with some even sending the lunchbox home with a note if inappropriate items have been included!). If possible, try to include homemade treats whenever possible as these are always going to be better than what you buy from stores. If you have the time, get your children to help you make up a big batch of mini muffins or biscuits that you can freeze and pop into their lunchbox on the designated day. Include wholegrain flours, oats, seeds, fruit, vegetables and a few choc chips (to make them happy!) in your homemade recipes. The beginning of the school year is usually hot and you might feel reluctant to send your child to school with perishable foods such as dairy, eggs and meats. Freezing drinks or yoghurts overnight and placing them in the lunch box can help to keep all food cool. Using insulated lunch boxes, with an ice pack as a coolant, is also a good solution.